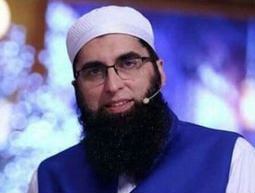 Junaid Jamshed - He was a young Pakistani recording artist who came to the limelight as front man of pop group Vital Signs in 1987 with the song “Dil Dil Pakistan” and remained a youth icon through the 1990s. In 1999, Junaid Jamshed released his debut solo album “Us Rah Par” which became an immediate national hit, followed by “Dil Ki Baat” in 2001. Junaid Jamshed transformed into a pious and religious man as his heart and mind turned towards Allah Almighty and left his music and engineering career in 2004. Junaid Jamshed now days know as Naat Khu’wan and a scholar. He was very active in Tablighi Jamaat. He frequently travels many areas of the world and inspires Muslims and for helping them to improve their practice of Islam. His most favorite album “Badee-uz-Zaman” was a special and famous album of the world in Islamic Naat Field. He gained immense popularity from the recitation of Naat Sharif in his beautiful voice. People get inspired by his changed personality and he became the eye candy of all. He has released several Naat Albums that are downloaded online and are purchased from retail stores. Since then he developed interest in religion and concentrated on singing hymns. Junaid Jamshed’s debut album Jalwa-e-Janan in 2005 was followed by Mehboob-e-Yazdaan in 2006. Some of his other popular Naats Sharif are Badr-ud-Duja in (2007), Yad-e-Haram (2008), Rehmat Ul Lil Aalamin (2009), Badi uz Zaman (2009), Hadi Ul Anaam (2010), Rabi-Zidn-e-Ilma (2011), and Noor-Ul-Huda (2013) to name a few. Junaid Jamshed also owns a clothing brand with the name "J. ", which has several outlets throughout Pakistan and some abroad as well. He gained worldwide fame and recognition for his clothing brand for men, women, and children. Junaid Jamshed was in Chitral, for a Tablighi Jamaat mission along with one of his two wives, Nahya Junaid. Unfortunately, on 7 December 2016, the two were returning back to Islamabad aboard the ill-fated PIA Flight 661, which crashed near Havelian, Khyber Pakhtunkhwa, killing all passengers on board. Junaid Jamshed was supposed to deliver the Friday sermon at the Parliament mosque. The news of crash spread like fire in the country. His fans and family members mourn for the loss of this great human being. As soon as the news broke out, J. outlets were closed across Karachi. According to the sources, all bodies were burnt beyond recognition; therefore, DNA testing will be required with the support of NADRA for identification. He is survived by his remaining wife, three sons, and a daughter. Junaid Jamshed has been listed by The Muslim 500 as one of the "World's Most Influential Muslims" due to his active involvement in charity work, specifically with the NGO Muslim Charity from 2003 until his tragic death in 2016. HamariWeb offers you Junaid Jamshed New Naats, and Junaid Jamshed Last Naat released last year and this year. Junaid Jamshed Naats are available in audio and video versions. Junaid Jamshed Naats covers his all collection. Junaid Jamshed last Naat was recited in Chitral on his Tabligh visit. Although he is not with us anymore; but you can facilitate from Junaid Jamshed Naats in his soulful voice online with ease. Some of the most popular Junaid Jamshed Naats are Qasida Burda Shareef, Madad Ae Mere Allah, Yeh Zameen O Aasman, Teri Rehmat ki Atta, Faizan E Muhammad to name a few. You can find all new Junaid Jamshed Video Naats on this page. You can listen to Junaid Jamshed Naat online and can download for free. You can share the favorite Naats with your family and friends.